Latest News | JillyJazz | Jill Strauss – Jazz dance classes in West Los Angeles, Choreography, Privates and more! JillyJazz Dance Arts is gearing up for our best year ever!!!! Adult classes, JillyJazz Kids, Workshops for teens and Workshops for Adults. Jazz, Tap and Joy!! Check our “Class Schedule” page for all our classes and “Workshops and Events” page for what’s upcoming!!!! Beginning Saturday, August 2nd, JillJazz will offer a new Beginning jazz class. 10:30 AM at The Crossroads School 1734 Olympic Blvd. in Santa Monica. Plenty of street parking and beautiful studio. 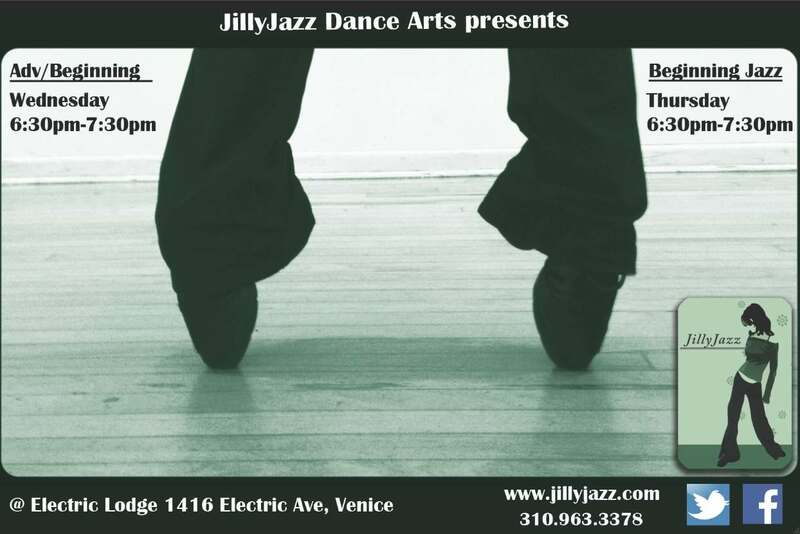 JillyJazz teen/adult beginning classes offered Wednesdays 6:30 Adv/beginner and Thursdays 6:30 Basic beginner both at Electric Lodge 1416 Electric Avenue in Venice. Come join Marina Munoz on the dance floor. Check out our entire schedule at jillyjazz.com/ class schedule. JILLYJAZZ KIDS Summer Session begins Friday, June 21st – August 9th. Exciting, affordable classes for kids ages 3 – 12 at the Electric Lodge 1416 Electric Avenue in Venice. Go to jillyjazz.com, click JillyJazz Kids for all the details. It is SOOOOO exciting. JillyJazz is growing!! Lots going on…. Beginning NEXT Sunday, February 3rd, our Thirteenth Winter Dance Workshop will begin and run for seven Sundays at the Crossroads School in Santa Monica. Go to “Workshops and Events” for all the info. JillyJazz Kids new nine week session just began and we are continuing to enroll. All classes on Fridays at the Electric Lodge in Venice. Kids 3 – 12 classes in Ballet, Jazz and Creative Movement. Go to “JillyJazz Kids” page for all the info. And……Marina Munoz is joining the faculty at JillyJazz to teach an Open Level Luigi Style Class on Wednesday evenings at 6:30 at Electric Lodge in Venice. Go to “Class Schedule” to check it out. Marina teaches our JillyJazz Kids program!! Wow, all so exciting . Lots to do, lots to choose from. JILLYJAZZ!!!! !